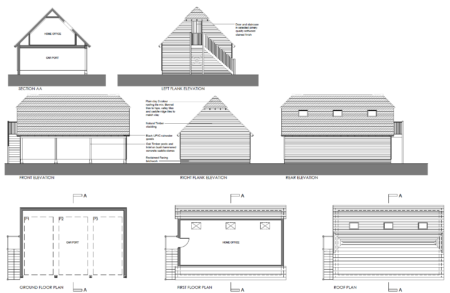 We write today about one of our smaller applications approved this week for a carport (garage) located near Chart Sutton under Maidstone Borough Council. Firstly, the task was not as easy as it sounds, and furthermore, our title is somewhat misleading as it is actually quite a sizeable building for its purpose! Patrick Durr Associates were contacted by an applicant having fallen foul of development control. Like many, this applicant had believed that they were allowed to replace a number of small garden buildings with a four-bay garage without planning permission. Further, they had proposed a large room above the unit with extended eaves to allow for a personal snooker room. Unfortunately, in this case they were incorrect and planning permission was required for the building works. The building contractor had already constructed two-thirds of the development when the Council’s Planning Enforcement Officer visited. The officer advised that the applicant make a planning application as soon as possible or demolition of the building would be recommended. As suggested, the applicant submitted a retrospective planning application for the building, however it was unceremoniously refused due to its size and bulk. Unfortunately, with this refusal the Planning Enforcement Department also began applying pressure and deadlines for this issue to be resolved. The applicant then contacted Patrick Durr Associates, initially hoping to appeal the Council’s decision via the Planning Inspectorate. After reviewing the scheme, we advised the applicant that we were not prepared to forward a planning appeal, as we believed the Council’s stance was correct and such an appeal would essentially waste time and money. Instead, we proposed an alternative scheme to the Council under pre-application discussions, hoping for an agreeable way forward. After a month of discussions and three designs later, we received positive news from the Council that it was happy with our proposed three bay carport with storage/office area above. As such, we submitted planning permission for this new building, which was approved without issue this week. 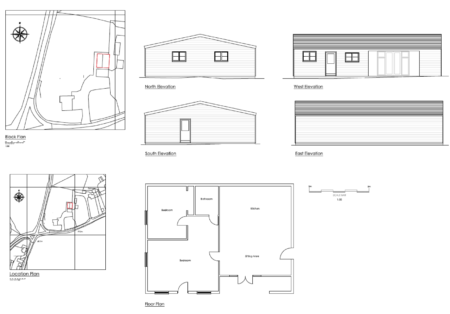 The applicant can now use the carport for vehicle storage, and the room above for a games room or office. In time, due to the purposeful design, the applicant may be able to convert the area above the carport into a studio holiday let providing a little extra income. Of course such a conversion would be subject to planning permission, the chances of attaining which would have to be assessed at the time. This is another successful case, where Patrick Durr Associates has managed to help an applicant in need and negotiate a mutually beneficial way forward for both Council and client. Remember if your application is refused: ‘T-FAL’ – Talk First, Appeal Later. Trying to negotiate a way forward with the Council is always quicker and cheaper than gambling on a planning appeal. If you need help finding a new direction, or you are unsure whether to appeal a Council decision or note, please contact Patrick Durr Associates. Patrick Durr Associates has successfully obtained planning permission for a new farm shop at an existing site near Marden, under Tunbridge Wells Borough Council. The application site was an existing Pick-Your-Own (PYO) farm, along with some haymaking and other related agricultural activities. The site had been operating as a PYO farm for over 25 years and had been utilising Portakabin and other small buildings for its shop, packhouse and coldstore use. In an attempt to clear the site and legitimise the main commercial activity, the applicants proposed a new all-in-one building to be sited nearer the existing access, and to incorporate all facilities provided by the ad-hoc mobile buildings. Following a successful pre-application meeting with the Council, we worked with the applicant and the design team (www.chrissaunders.co.uk) to ensure that the building was not only aesthetically correct, but that it also worked for both the farm activities and the public. The planning application was a short and swift process mainly due to the intensive work put in at the pre-application stage. With a delegated decision for approval, the applicants can now happily look forward to the summer season 2018. Please contact Patrick Durr Associates if you have a similar commercial enterprise that you are looking to enhance or take to the next level. Patrick Durr Associates has successfully achieved a beautiful new-build barn dwelling with ancillary building following the applicant’s very rocky start, under Wealden District Council. The applicant owned an agricultural barn near Lower Dicker, set within approximately nine acres of land. 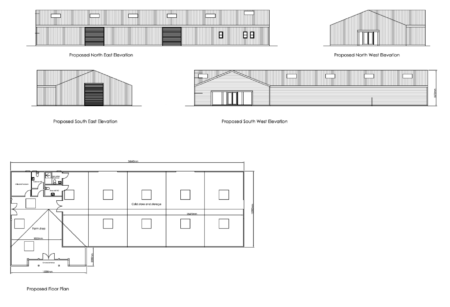 Correctly, the applicant looked to use the recently published permitted development rights (PDRs), allowing the conversion of an agricultural building to residential use. The applicant submitted this application under another planning consultancy, and unfortunately permission was refused. Unfortunately, the main reason for refusal was that the barn was not in sole agriculture use when it was inspected by the Council and therefore it failed to qualify the PDR. The applicant contacted Patrick Durr Associates, understandably concerned that this refusal ceased any future residential development at the site under the PDR provision. Following an initial telephone discussion, Patrick Durr Associates was able to understand the history of the building, its current use, and the reasons why there was currently a mixed equestrian/ agricultural and storage use of the building. With this information, we were able to identify that the Council had incorrectly refused the application on a technicality and it should have in fact have been approved. Patrick Durr Associates then wrote to planning management at Wealden District Council highlighting the officer’s error and proposing an alternative way forward. 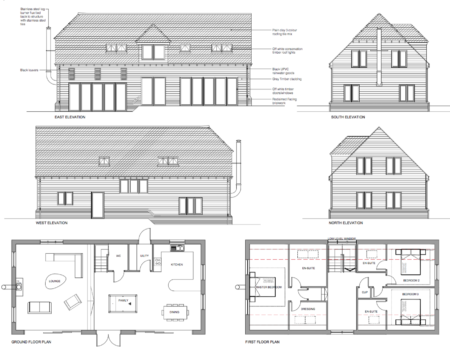 Instead of proving that the Council was wrong through a Planning Appeal which would waste significant costs and time, instead we proposed that the applicant be allowed a new-build dwelling in lieu of the existing barn. It is important to note that Wealden District Council offers a very useful Supplementary Planning Guidance (SPG) allowing qualifying agricultural buildings, which would normally utilise the PDR for conversion of the building to residential use, to instead propose a demolition and new-build proposal under the standard planning application process. This is a much welcomed approach and leads to better, more purposeful developments in line with national policy requirements. Following our correspondence, the Council were very accommodating and agreed to our mutually beneficial plan. 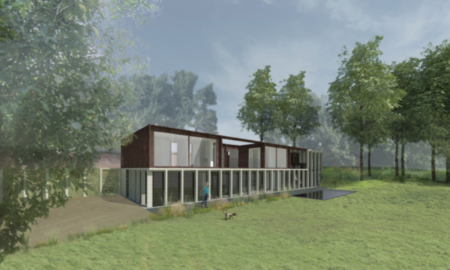 After several pre-application meetings the applicant was able to submit an impressive new dwelling scheme with separate carport and accommodation above, designed by Alex Rayner of Level Architecture (www.levelarchitecture.co.uk). Thankfully, despite a few small issues raised during the Council’s assessment, the application was approved at Planning Committee with no votes against the scheme. In fact, a number of Councillors commented how the design was in-keeping with and enhanced the local area. All in all, this was an excellent example of helping an applicant achieve an enviable outcome from what was a very unsatisfactory beginning. It also emphasises the importance of achieving the correct professional advice at the right time to avoid unnecessary stress, time and cost. If you are considering a new development project, be sure to Contact Patrick Durr Associates from the beginning. After a prolonged journey, we have successfully achieved a stunning replacement dwelling near Goudhurst, under Tunbridge Wells Borough Council, fit for Grand Designs! The applicant purchased the beautiful site with planning permission for a generic replacement dwelling scheme already extant. The applicant and their family wanted to compliment the stunning location with an exciting design, away from the routine and ordinary. 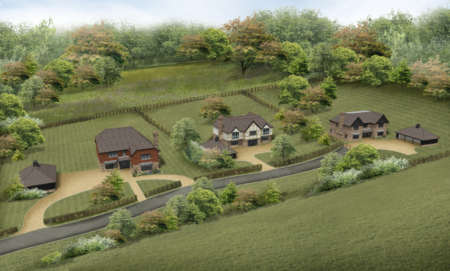 Despite this aim, the site was situated in a rural location and within the High Weald Area of Outstanding Natural Beauty and therefore any proposal needed to note the sensitive location. Initially, the applicant instructed an architect alone to forward the scheme, and following a pre-application meeting with the Council, significant issues were highlighted. As such, Patrick Durr Associates was instructed to work alongside the architect to address the Council’s concerns where possible and hopefully realise the applicant’s dream. We were able to advise on potentially acceptable size and design changes, and also recommend the use of other consultants required for this type of application, including landscape architect and ecologist. Following this new approach, a second pre-application meeting was held with the Council which was extremely successful, and therefore we proceeded on to submission of a full planning application. During the assessment there were a number of issues raised by the Council and consultees. which we were able to address quickly. This accepted, unfortunately we ran into concerns regarding bats, but luckily had already instructed a bat emergence survey to be undertaken which eventually alleviated these also. Usually, a planning application Council assessment should take eight weeks, however due to the questions raised and Council workload delays, the application took nearly 6.5 months! In spite of this delay, we were delighted to eventually forward a planning approval for this architecturally striking design by Ph+ Architecture (www.phplusarchitects.com) to the applicant. This application serves as a lesson in planning patience and ensuring you have the right team around you from the start. We are delighted to have been involved in such a fantastic project with such an exciting, modern brief. If you are considering a development out of the ordinary, please Contact Patrick Durr Associates.